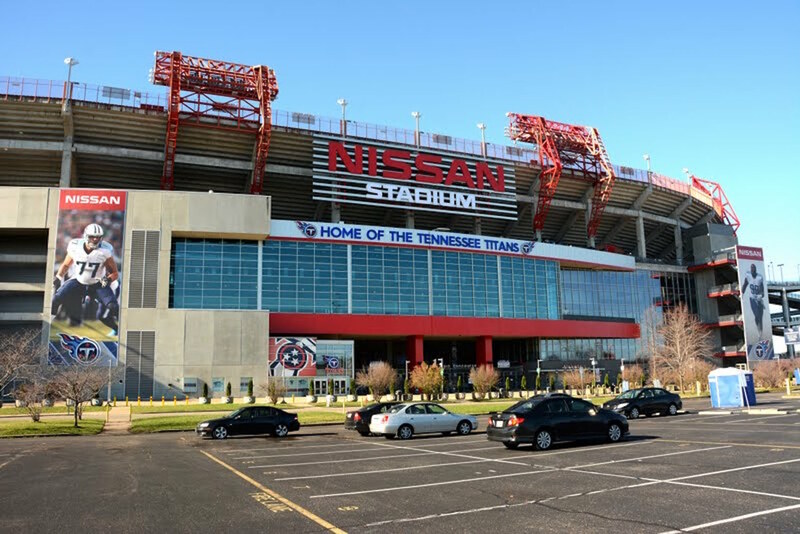 If you’ve visited Nissan Stadium to watch the Titans this year, you may have noticed some big changes around the place. 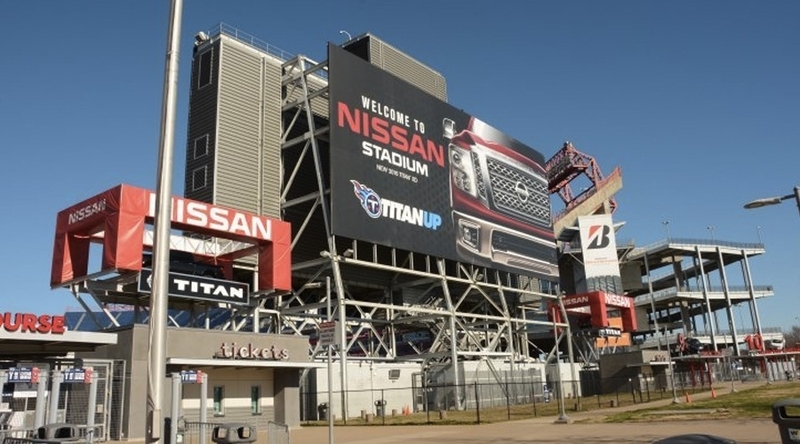 That’s due in no small part to our team’s hard work, as Big Visual Group is the official print partner of the Titans and Nissan Stadium. 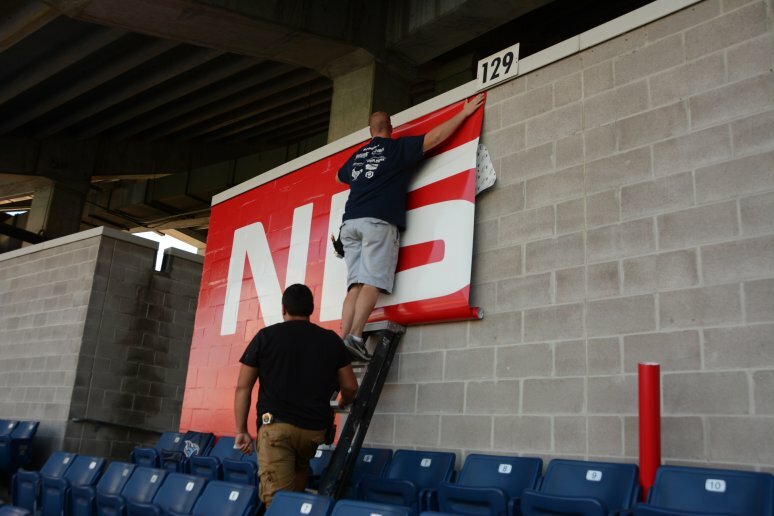 With brand new banners decorating the stadium and colossal signage around its exterior, Big Visual is just getting started with a complete stadium rebrand. Establishing integrated visual branding is no quick process. Although tons of work have gone into the rebrand so far and the new visual components look stunning, this project will be ongoing for two to three years as the Big Visual team perfects every last detail. You’ll increasingly see and feel the difference of this branded environment as time goes on. Think about the gates and the area under the stadium. Previously, this area was mostly gray concrete with no discernible visual theme. That’s all beginning to change as Big Visual adds new elements that fit together from a design perspective. Banners, pole wraps, concession signage and more will bring a unified theme to the area. And it doesn’t stop with the stadium. Even the parking lot will soon feature new directional signs and wayfinding elements that Big Visual prints and installs. Here are some of the more massive projects we’ve undertaken so far at the stadium. 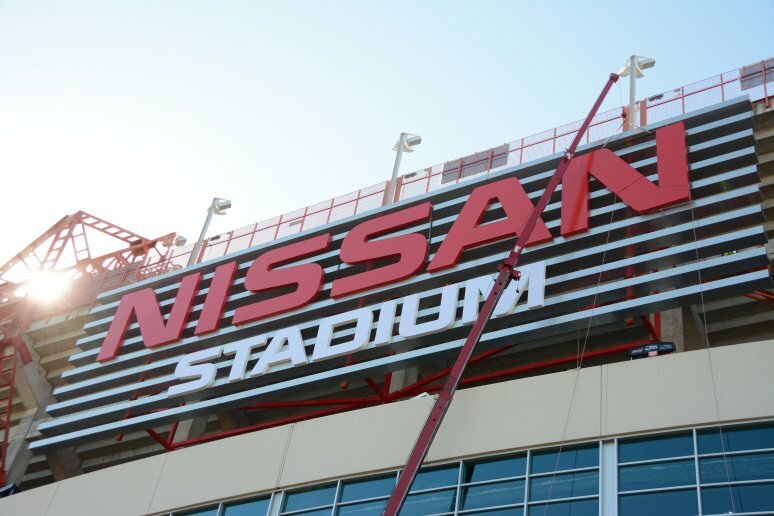 Big Visual concepted and designed the enormous Nissan Stadium marquee, which was fabricated and installed through a partnership with A1-Signs in Dixon, Tennessee. With 15-foot-tall letters, this beauty weighed in at over 35 tons. We designed, color-corrected, printed, welded and had the back of the scoreboard installed to be structurally sound. This colossal sign is over 50 feet tall and 117 feet wide. The stadium recently unveiled this huge framed banner featuring players on the East side of the stadium. We designed and produced this as well. Another unique feature that the Big Visual design team concepted are the entry gates into the stadium. In an effort to address the need for better wayfinding signage that directs fans to the appropriate gate, the team designed and created a brand new set of illuminated letters and much larger numbers to each gate. 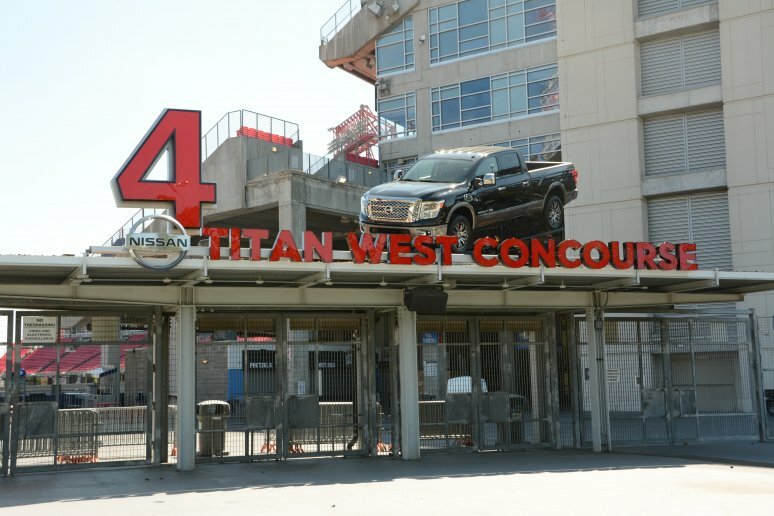 To add a creative touch that ties the Nissan brand closer to the stadium, Big Visual named each gate after a Nissan model and then put that model of car on top of the gate. 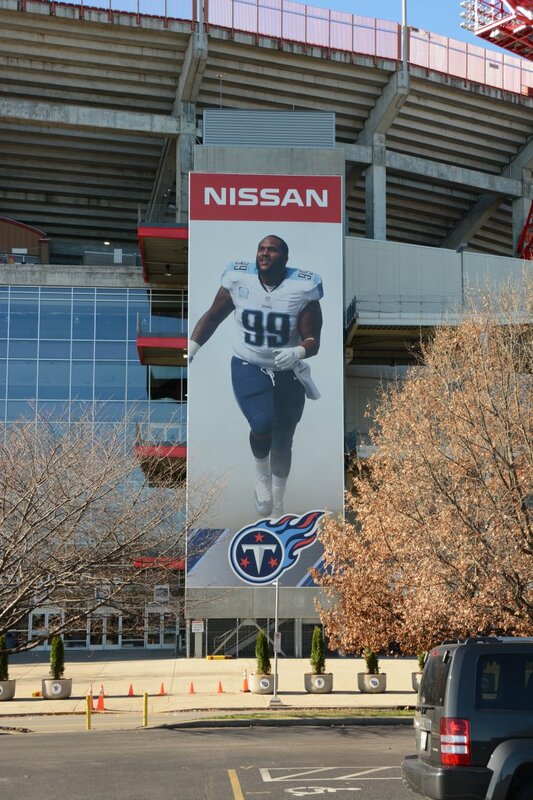 From the textured wall vinyl on the corners of the stadium to the new tunnel coverings, Big Visual worked closely with both Nissan and the Titans to brand the entire environment of the stadium. As the rebrand continues, there will be many more additions throughout the stadium. 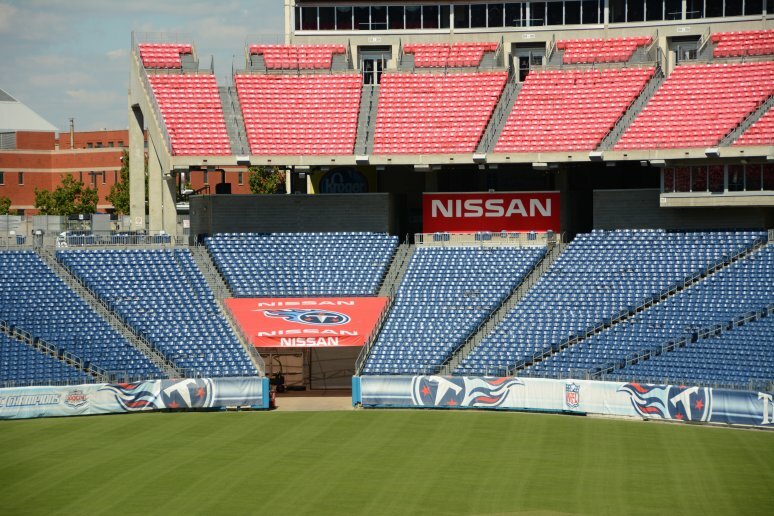 Look for Titans FanZone enhancements and new accents on the club level. We’ll create environmental graphics and wall murals in corporate suites to brand them for their respective companies. Though the stadium is well on its way, it’ll feel like even more of a top-level professional venue in a few short years once the integrated visual branding is complete.